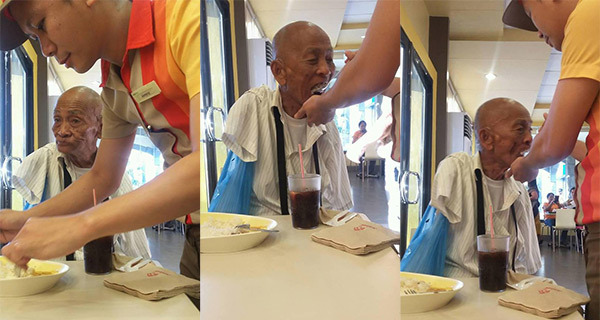 A female crew member of a Jollibee branch in La Union has received praises from Filipino netizens worldwide for feeding a poor armless man. Marie Zelda Idelle Biteng, who took photos of the heartwarming scene, appreciated the fastfood employee in a Facebook post that went viral since Friday, February 19. Biteng said she was "almost always disappointed" with the service of Jollibee Agoo but was touched with the act of kindness the good samaritan identified as Jemcy Garcia Carino had shown. The armless man tried to eat by reaching his mouth to the food on his plate then came Carino and helped him out, Biteng said. She actually shared the senior citizen's table while waiting for her order. Social media users hailed the Jollibee crew, telling her to keep up the good work. Biteng's post has been shared over 23,000 times as of 2:20 p.m. on Saturday, February 20.